12 | November | 2017 | A balanced diet . . .
A couple of months back, I enjoyed an excellent 672 page biography of Confederate Major General Thomas J ‘Stonewall’ Jackson. Written by SC Gwynne in 2014, Rebel Yell: The Violence, Passion, and Redemption of Stonewall Jackson is an account of Jackson’s theatre of operations in Virginia (and in those areas that became West Virginia after it broke from Virginia in 1863), which centered on the Shenandoah Valley, a region just north of where Steph and I travelled across the Appalachians in June this year. Jackson’s death (from pneumonia after he was wounded in the arm by friendly fire) following the Battle of Chancellorsville in Virginia from 30 April to 6 May 1863 is perhaps among the most significant ‘What if’s’ of the American Civil War. Stonewall was undoubtedly one of the Confederacy’s most successful generals, and history is left to ponder what the outcome of the Civil War might have been had he lived longer, and his success rate against Union forces maintained. Steph and I saw evidence of the conflict, the to-ing and fro-ing of opposing forces, when we visited the Pinnacle at Cumberland Gap on the borders between Virginia, Kentucky and Tennessee. Successive Union and Confederate forces fought over and continually swapped possession of this key passage through the mountains. And now I have just finished another book, Noah Andre Trudeau’s 2008 Southern Storm: Sherman’s March to the Sea (at 671 pages) based in large part on the personal accounts of officers and men among the 60,000 who took part in the November-December 1864 campaign in Georgia (the Empire State of the South) led by Union Major General William Tecumseh Sherman, from Atlanta to Savannah, 250 miles to the southeast on the Atlantic coast. They were divided into different columns, and lived off the land as they moved south, through landscapes that hindered their progress as much as did the continual harassment from Confederate forces on their periphery. Our 2017 USA road trip began in Atlanta, and paralleled, I now discover, the route of Sherman’s March to the Sea although his route took him further east. His occupation of Savannah (where we stayed for a night), and subsequent move up through South Carolina (just as we did) marked the beginning of the end for the Confederacy, as Sherman and his superior, Ulysses S Grant, closed in on Confederate capital Richmond in Virginia, and the final capitulation of Confederate forces under General Robert E Lee at the Appomattox Courthouse in April 1865. Arriving in Savannah, Union forces found an elegant city of wide, tree-lined boulevards (hanging with Spanish moss) and quiet squares, much as Steph and I did on our trip. Savannah was a delight. After the end of the Civil War, Sherman’s ‘exploits’ in Georgia were immortalised in Marching Through Georgia, composed by Henry Clay Work. To me, three aspects of the Civil War stand out. This must have been one of the first wars in which an extensive railway network transported troops and supplies over long distances. In Georgia, Sherman’s troops ripped up hundreds of miles of railway tracks on their March to the Sea. Second, the electric telegraph was an essential (but not always available) system of communication between armies and civilian administrations. Thirdly, the war must also be one of the first to be documented in detail photographically. New York-born Matthew Brady was one of the earliest photographers in the country, renowned for his Civil War output. Having criss-crossed this region and the southern Appalachians myself, I remain in awe of the feats undertaken by both Union and Confederate armies, tens of thousands of men marching across some of the most difficult terrain, under the most adverse weather conditions, and then having to face each other in battle. The casualties on both sides were catastrophic, the wounds inflicted unimaginable, and rudimentary surgery and medical care often leading to as many deaths after the battles as during them. Conditions in camps were frequently squalid, and diseases were rife. In fact, as many soldiers may have died from disease as on the battlefield. So what has this whole saga got to do with genetic resources? Let me explain. In an earlier post about crop diversity, I’d commented on soldiers’ accounts of the ‘corn fields’ which they passed, the long-strawed varieties grown, and through which they trampled during the Battle of Waterloo. In their commentaries during the March to the Sea, Union soldiers were fortunate to live quite well off their foraging activities. In fact, this was part of Sherman’s overall strategy, although backed up with sufficient supplies and beef-on-the-hoof for about five to six weeks, and his calculations based on an understanding of the agricultural economy of the region through which his army would pass. Soldiers report dining on hogs and chicken, potatoes and sweet potatoes in abundance, peanuts, rice, molasses and honey. I think that, in general, ‘potatoes’ probably refers just to sweet potatoes (Ipomoea batatas) rather than so-called Irish potato, Solanum tuberosum. It interesting to note how important were three crops not native to this southeast region of the country, nor the USA in general: sweet potatoes (from the Asia-Pacific region), peanuts from South America, and rice from Africa and Asia. This was, of course, a slave-based economy. Without slave labour, the growing of cotton and rice would have been almost impossible. In antebellum Georgia (as in South Carolina) rice cultivation was very important since the early 18th century. As Sherman’s armies approached Savannah, they encountered rice paddies more frequently. Some had standing crops which they harvested and processed in numerous rice mills once they got them operational again. Other rice paddies, closer to the city, had been flooded (perhaps also with brackish or salt water) and were formidable barriers to infantry. Crossing these wide open landscapes, deep in mud, attacking Union troops were clearly exposed to Confederates entrenched behind carefully-sited defensive lines. 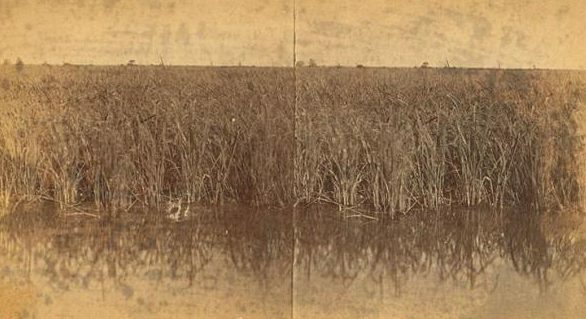 On Monday 19 December 1864, during a manoeuvre on difficult terrain to cross over the Savannah River into South Carolina, one soldier from Massachusetts wrote: We came across rice fields all cut up with ditches from 1 to 10 ft wide, which we had to get over as best we could; part of the way was through rice as high as our heads & all wet with dew. Clearly not a modern HYV! So what could this rice be? It was probably Carolina Gold, a variety originally thought to have been introduced into South Carolina and Georgia from Madagascar¹. The slaves, many from West Africa, knew all about growing rice, since there is an indigenous rice culture in that part of the continent. Rice cultivation went into decline after the Civil War, due to many factors including the destruction of paddies, reluctance of emancipated slaves to take on this work, and other global trade pressures. Other parts of the USA became important rice-growing areas, such as California, southern Texas, Louisiana, and Arkansas. By the 1940s Carolina Gold was hardly in cultivation anywhere. Was it lost? Not completely. In the 1980s, a eye doctor from Savannah by the name of Dr Richard Schulze (and a keen duck hunter) discovered that seeds of Carolina Gold were held in a USDA collection at Beaumont in Texas (the USDA’s rice collection is now held at the Dale Bumpers National Rice Research Center-DBNRRC- in Stuttgart, Arkansas). Scientists at Beaumont multiplied seeds of this accession, sending Schultze some 14 pounds of seeds. By 1988, these had been multiplied to 10,000 pounds. Carolina Gold is now grown quite widely, among other heirloom varieties. 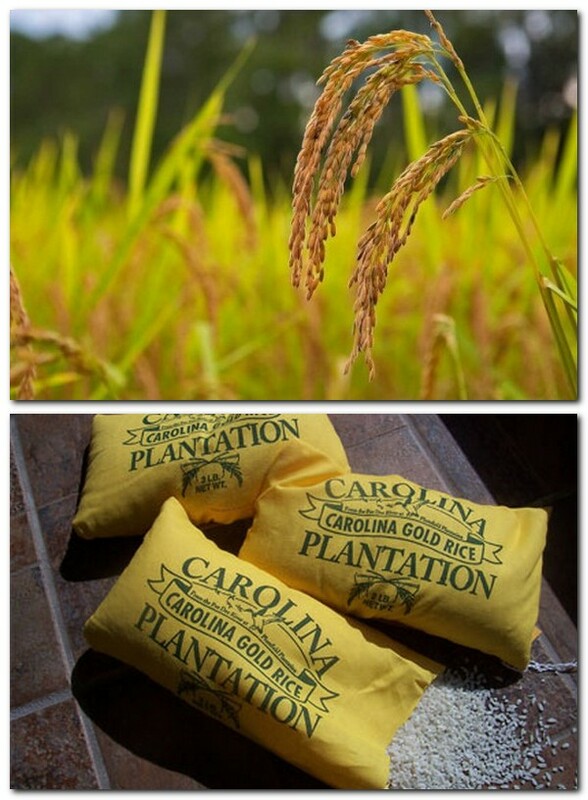 There is even a Carolina Gold Rice Foundation whose mission is to advance the sustainable restoration and preservation of Carolina Gold Rice and other heirloom grains and raise public awareness of the importance of historic ricelands and heirloom agriculture. In October 2010, my former IRRI colleague, Tom Hargrove (who passed away in January 2011) writing for Rice Today about two varieties of rice, Carolina Gold and Carolina White, found along the banks of the Amazon in northeast Peru, conjectured that they were taken there by Confederados, people from the southern US who moved to Brazil around the time of the Civil War. The rice, called Carolino by local farmers, was found by CIAT rice breeder (and an old friend of mine), César Martínez. When I checked the Genesys database, I found 19 accessions with the name Carolina Gold, in the USDA collection and in the International Rice Genebank Collection at IRRI. Most have available seeds. The accessions at IRRI are duplicates of USDA accessions. Some are breeding materials or selections. I wonder which one was provided to Richard Schulze? In any case, even though they have the same Carolina Gold name, I wonder how genetically distinct they are from one another. Once again, my interest in the American Civil War (and history more generally) has come together with my other ‘obsession’, the conservation and use of plant genetic resources. ¹ Just after I posted this story earlier today, one of my friends from the Crop Trust, Luigi Guarino, Director of Science & Programs at the Crop Trust, told me that he had also posted something about Carolina Gold in the Agricultural Biodiversity Weblog in November 2007. He was commenting on a paper by Anna McLung (Director of the DBNRRC) and a colleague who used molecular markers to assess the affinity of Carolina Gold with other germplasm from Africa. It seems it was more closely aligned with germplasm from Ghana than Madagascar, fitting in better with the slave trade links between West Africa and the early colonies on the east coast of the United States. Hargrove refers to a Madagascar origin for Carolina Gold, and was obviously not aware of the paper by Anna McLung. And it seems there’s more to be found about Carolina Gold from a whole slew of stories on the Agricultural Biodiversity Weblog.